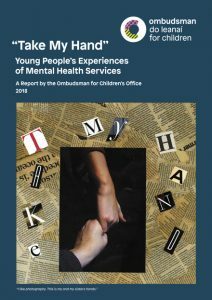 The OCO began a consultation with young people in 2017 to hear and highlight their experiences and perspectives on receiving inpatient mental health care and treatment, as well as their journeys through mental health services. We aimed to engage directly with young people under 18 receiving inpatient mental health care and treatment and to support young people to reflect and share their views on mental health services, based on their experiences as service users. We also aimed to enable young people to identify changes, which they feel would improve supports for young people in relation to their mental health and to highlight young people’s views and ideas to policy-makers and practitioners working in the area of children and young people’s mental health.